DA Form 5557 - also known as the "Individual Reliability Screening And Evaluation Record" - is a United States Military form issued by the Department of the Army. 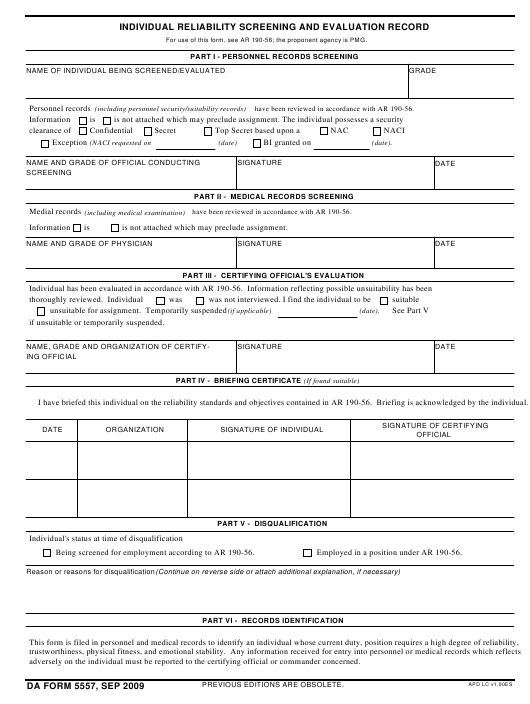 The form - often mistakenly referred to as the DD form 5557 - was last revised on September 1, 2009. Download an up-to-date fillable PDF version of the DA 5557 down below or look it up on the Army Publishing Directorate website. For use of this form, see AR 190-56; the proponent agency is PMG. have been reviewed in accordance with AR 190-56. (including medical examination) have been reviewed in accordance with AR 190-56.
is not attached which may preclude assignment. if unsuitable or temporarily suspended. I have briefed this individual on the reliability standards and objectives contained in AR 190-56. Briefing is acknowledged by the individual. Being screened for employment according to AR 190-56. Employed in a position under AR 190-56.
adversely on the individual must be reported to the certifying official or commander concerned.